A crowd-funding campaign "to buy Duncan Storrar a toaster" has raised more than $25,000 after the Aussie battler took on both the Assistant Treasurer and AIG's chief during Q&A. John Passant reports. DUNCAN STORRAR is a hero. He made a pretty obvious point. A lift in the tax-free threshold would improve his life. He survives on the minimum wage and benefits related to his disability. Assistant monster Kelly O’Dwyer told him it was all about balance (seriously!) 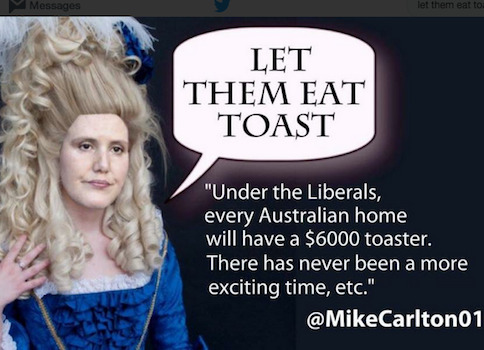 and business now being able to buy $6000 toasters. Toorak toasters anyone? Spokesthing for the Australian Industry Group, Innes Willox, slithered out from under his super rich rock and showed his caring side. It was a classic put down of an arrogant, dismissive, out of touch, ruling class blood sucker. The vultures of the press – the capitalist class and the politicians who don’t understand, or worse attack Duncan, like Willox did – say he is already getting more for the State than he pays in tax. This is not correct. Duncan, as he pointed out, pays GST and as a percentage of his income pays lots more GST than either Willox or O’Dwyer (on average about 34% of his income compared to 5% or 6% for Willox and O’Dwyer, according to Figure 16 from the ACOSS Inequality in Australia: A Nation Divided report). Second, tax and spending are two matters that are not susceptible of being netted off. One represents raising revenue and the other represents spending to achieve societal or other goals. Third, Duncan’s position has worsened in comparison to O’Dwyer and Willox over time. His wages have grown at a rate well below the rate the remuneration of the top 1% has grown. Fourth, Duncan’s wages and support payments mean he is close to the poverty line, which, for a couple with two children, was $841 per week in 2014. Every day is a struggle to make ends meet, even with government support. Fifth, the income the ruling class are taxed lightly on is not theirs. It is the unpaid labour of workers — workers like Duncan. The answer is not to play games like business and the media do, and net off government payments against tax paid. The answer is to increase Duncan’s wages and the government support payments he receives so he can take his daughters to the pictures on the weekend. John Passant is a former assistant commissioner of the Australian Tax Office. Read more by John on his website en Passant. You can also follow him on Twitter @JohnPassant. This story was originally published on John Passant's website en Passant on 10 May 2016 and has been republished with permission. BREAKING: News Corp says Duncan Storrar paid no net tax in 2013-14, just like itself.